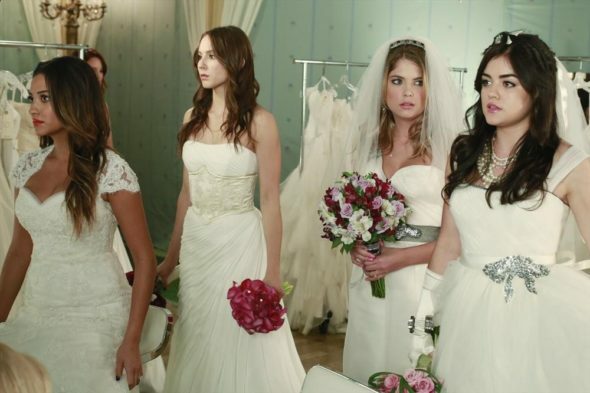 Pretty Little Liars: Season Seven to Feature a Wedding? Who’s getting married? TVLine reports there will be a wedding in season seven of the Freeform series Pretty Little Liars. The mystery drama stars Lucy Hale, Ashley Benson, Troian Bellisario, and Shay Mitchell as a group of friends plagued by dark secrets. Sasha Pieterse, Janel Parrish, Ian Harding, Holly Marie Combs, and Chad Lowe also star. Sadly, besides the teaser, King gave no other clues about who was getting married. Season seven debuts on Freeform on June 21st. What do you think? Are you a fan of Pretty Little Liars? Who do you think is getting married? More about: Freeform TV shows: canceled or renewed?, Pretty Little Liars, Pretty Little Liars: canceled or renewed? Pretty Little Liars: Are There Plans for a Movie, Spin-Off or Revival?